We are proud of our village in Shadwell and invite you to explore these pages. Better still, come and visit us sometime to see our achievements created over the last few years. 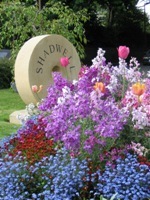 The purpose of Shadwell in Bloom is to improve the social and physical environment of the area in which we live and to create a more picturesque Village. Much of the work is done by loyal and hard working volunteers who contribute to the planning of future development work, and some are involved in bed design. SIB has a presence at the Shadwell Flower Show in August. SIB is much involved in works not involving flower beds at all. Here for example, Shadwell Primary School has benefited from our re-fencing of their roadside boundary, new fencing off of the pre-school bungalow area, and construction of the allotment and nature garden areas. The Shadwell allotments were created by our volunteers and the maintenance of the nearby Recreation Hut areas are within our work schedule. There are similar histories for our work at Dan Quarry, Shadwell Library and the Village Hall. The Garden of Remembrance at the Churchyard is now maintained by St Paul's Church. For details of the establishment of the garden via the efforts of Celia Wroe and Richard Wells see the Churchyard page.